The KEY to maximizing performance is missing from all Certified Personal Trainer Protocols! It isn’t about the methods of Exercise used, it’s about the Body’s ability to gain value without unnecessary pain. The WATER you drink determines your performance! Bottled Water, Tap Water, RO Water, So called Smart Water, Live Water etc are all ACIDIC Water! They are labeled “PURE” because of the removal of Impurities, however that leaves them measuring an Oxygen Reduction Potential (ORP) of +400 to 600 mV and a pH of 3 to 4! These measurements relate to an Extremely Oxidizing liquid that should be called “Pure FREE Radical” water. It CAN’T HYDRATE, it can only extract electrons from your body and it certainly doesn’t satisfy any thirst. 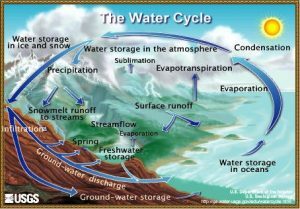 A Si mple explanation of GODS WATER is an explanation of the Earth’s Water Cycle. Beginning with evaporation of Oceans, lakes, rivers and surface water, Natural Water Vapor rises into the atmosphere until it hits the Dew Point temperature (Fog, Clouds etc) and collects into a Mist of vapor clouds that then move through the air, passing through the Magnetic Field of the Earth. Are you with me? When Clouds become turbulant, the Ionic charge builds up in the pure water molecules and eventually, lightning discharges to earth or another cloud. Yes, Water stores ION Energy. When the Rain Water falls and at the same time the temperature is near freezing, it TURNS TO SNOW! Of course! you say. 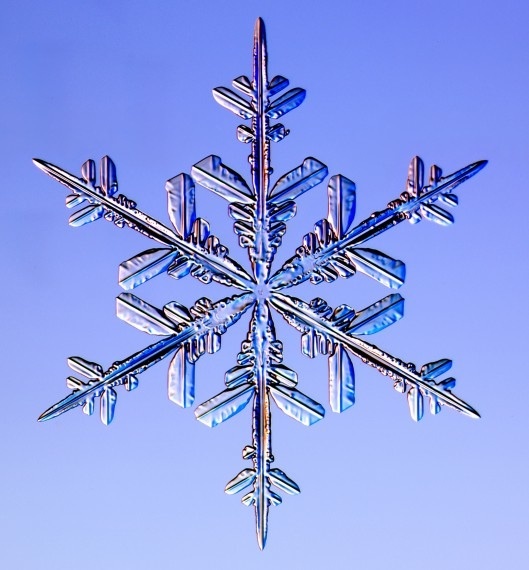 SNOWFLAKE ARE BUILT FROM HEXAGONAL RINGS OF WATER MOLECULES, LIKE LEGO BLOCKS. SIX MOLECULES (6) FORM A NATURAL GEOMETRIC RING. EVERY TIME! These Hexagonal Rings of water are the size and shape that the Human Body has receptors/ portals for, passing them into the inner body and immediately ENABLING THE RED BLOOD CELLS for carrying Oxygen, Nutrition, Energy to the Cells and Waste from the Cells. You can experience this personally by adding the Alkalized Kangen (restored to Origin) water and your own workout. So, your workout with the water will allow more Energy, Endurance, Performance without Delayed Onset Muscle Soreness (DOMS) which is another name for retained buildup of Lactic Acid in the Muscles causing Pain and Tightness as an effect in the following days. If we apply the above information to the Protocol of Personal Trainers, we replace their explanation that “Your exercise tears the muscle down, and it takes 2 days of rest for the muscle to build back stronger!” with our water that enables your blood to carry the waste out of the muscle within 10 minutes of drinking your first glass! 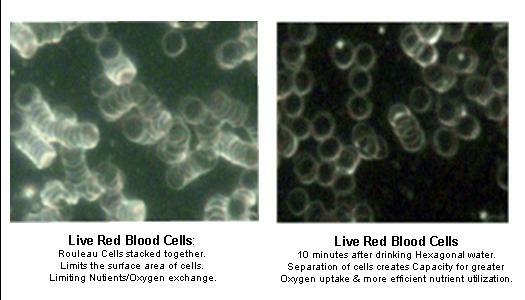 See videos showing the Bright Field Microscopy of a person’s Blood and again 12 minutes after drinking 4 oz of the water. For those wishing to receive a Text whenever I update the Blog (70+ Posts so far) please Send aText with “your name, LinkedIn and Update me” to 720-262-9631 which is an automated way I use to notify people of updates. you can opt out at any time. Or you can personally call/text me (Keith Flint 720-281-3965 ) for direct conversation. text before calling, please. I live on a 70 acre ranch with limited cell service, but texts come through quickly. It makes me more likely to be reachable by phone. Your comments and thoughts would be appreciated. Fitness and Hydration, the key to performance! In the last post, we discussed the various properties of Water that is generally available to us today. I also went into a scientific explanation of the terms used. Many have quit reading, way back when I started talking like an Engineer. That’s too bad, because here is where we begin to understand how the water does what it does for LIFE of any kind, but Humans in particular. Life is in the BLOOD! Your Blood should be around 92% water! BUT, the only water that can reach the blood in it’s proper form is the SINGLE RING OF 6 Molecules (think snowflake crystal) which match the size of the portals in the body that let the water reach the Red Blood Cells. Why the “Ring of Water?” Because it serves as a platform in the cell that allows it to CARRY OXYGEN, NUTRITION, ENERGY to the Cells and REMOVE THE WASTE CARRYING IT TO THE KIDNEYS and out of the body and of course, the Carbon Dioxide back to the lungs. I also showed you a 1 minute video showing the immediate effect on the Red Blood Cells (RBC) from which point we will start today in making application of this information to your Fitness or other Exercise protocol. Lets review that video one more time. OK! IT’S TIME TO INTRODUCE THE “MISSING LINK” OF YOUR OWN FITNESS OR WORKOUT REGIMEN. I have taught this to many Certified Personal Trainers and had them prove it to themselves and their clients easily and effectively. Let’s start with the common explanation of the standard Exercise Protocol. First you are introduced to a particular series of exercises that you will be repeating and increasing in the future. After a mild workout, you are scheduled to come back an about 3 days because your newly stressed muscles need several days to rebuild ( they will be sore) and theoretically they explain that the muscles have to be “Torn Down” and need 2 days to REBUILD ! The Certified Training had taught all about the various Muscle groups, ways to activate and exercise them and how to use various pieces of equipment to accomplish the desired results. They had been educated in Protein and Whey products to help “Build” Muscle. Natural, energized, Hexagonal restructured water! wait a minute, I drink lots of water, you say. Well, is your water part of the problem or the solution? Drink a quart of our Natural but Restructured water before exercising and Expect to be able to do more, with less “Stored Lactic Acid” in your muscles. Training for a competition? Do Doubles and Triples, just stay hydrated by drinking at least 1 ounce or more of this water per pound weight daily. Don’t be surprised if you lose between 10 or 20 lbs initially in the first week or so. This water cleanses the digestive tract of your body and eliminates the long term build up of “stuff” in your Colon! See the impact on YOUR Colon and its restoration within days, certainly within the 90 days shown here. OH! By the way, your Stomach issues will also have disappeared. Things like Crohnes Disease, Irritable Bowel Syndrome, Acid Reflux and other digestive disorders because your stomach has been restored to an Alkaline State as well as the entire Stomach, Intestinal Tract and Colon. Lets see, what else would I might experience. Better Sleep and rest? More mental clarity? less or no headaches? Better absorption of my supplements? The loss of the need for Medications for High Blood Pressure? Well, I think you can see the picture. AND ONLY YOU CAN MAKE THIS DISCOVERY! IT’S UP TO YOU, YOUR CHOICE, YOUR RESULTS. Text “30 day challenge” to 720-262-9631 and let me see where you can get this experience. Currently in Colorado Springs, Fit Body Boot Camp on Fillmore St and Capri Fitness Center on Academy have the water. Ask for more info and I will pass it on. Next post. What athletes use Kangen Water? Really, a body builder who won World Competition twice, came out of 4 years of retirement and in 3 weeks won first in two areas in the Canadian Nationals. He prepared by doing TRIPLE EXTREME workouts daily with the water! Then he went on to win 3rd in the World in Greece, 3 months later. Boy, doesn’t that upset the apple cart. I thought it took a year of serious training to expect to win in body building!! Fitness and Hydration, the role your Water plays! Today so many people are flocking to the local Gym, Exercise class, Dance class, outdoor activities and more. Their reasons vary, but it seems that their HEALTH is their primary concern. Given that fact, the ONE THING that they are not aware of is just how the water they drink effects their results. When will you realize WHY your Blood is so important? In a previous Post I showed your body with the skin/muscle/skeleton removed! 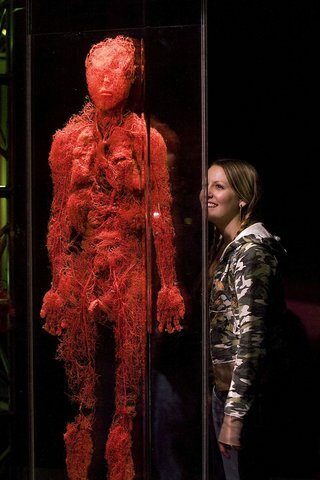 Yes the 57,000 miles of Blood vessels, arteries, veins and Capillaries that service every cell of your body. It becomes obvious that we should be most concerned with the condition of our Blood! so What can we do to make a difference? First, What does Blood require? OH! It’s 92% Water. But, you say, “I Drink lots of water” NO! you drink lots of liquid, often labeled as water. Let me explain. The Origin of water starts with Evaporation from Oceans, lakes, and rivers. The Evaporated water rises into the atmosphere until it forms “Vapor” which at the right temperature forms Clouds. Clouds move through the Magnetic Lines of Force of the Earth charging the Water Molecules with Ion energy. Lightning is an example of the power of water energy storage. Turbulent Clouds rapidly charge the water molecules until collectively, they must discharge to the earth or a lesser charged cloud. This PURE, ENERGIZED RAIN WATER at the right temperature (Freezing) explodes into a CRYSTAL form. We call it a Snowflake! 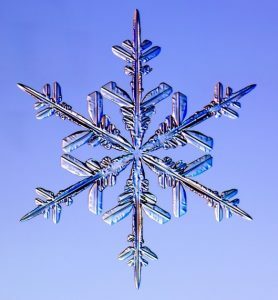 Even though each Snowflake is unique, it is formed from the building blocks (like Lego’s) of a Hexagonal Ring of water. Six molecules that connect Hydrogen to Oxygen to Hydrogen to Oxygen until it forms a complete ring is the ORIGINAL PURE ENERGIZED STRUCTURE OF WATER THAT YOUR BODY NEEDS. Your Body uses the Hydrogen for Healing. The only source of Hydrogen on earth is Water! Plant life also produces Alkaline product with the Sun’s Rays interacting with the Water to make Edible Vegetation, Berries, Fruit, Flowers and roots which are rich in Hydrogen. When commercial Bottling Companies produce their water, for safety purposes they use extreme filtering processes. They then claim that it is “Pure” because they have removed as much of contaminates in the water as they can. Unfortunately, the contaminates were connected to the water molecule by the extra Hydrogen that was not part of the linking of the Hexagonal ring. Extracting the impurities often dislodges the Hydrogen it was attached with. Most of you have quit reading way back when I started talking like an Engineer. That’s too bad, because here is where we begin to understand how the water does what it does for LIFE of any kind, but Human in particular. “ASTHMA” is an example of the result of Dehydrated Blood Cells, where the blood cannot deliver adequate Oxygen from the lungs nor carry the Carbon Dioxide out of the body. The Symptom is like self suffocation! The first level of solution is HYDRATION. How do we know this? Well, The primary Medical solution it to give one an “ANTIHISTAMINE” which opens the Lung sac’s and allow oxygen flow. This seems like a right solution doesn’t it? However, the Body produced the original HISTAMINE to close the lungs down BECAUSE THE BODY WAS DANGEROUSLY DEFICIENT OF HYDRATION AND IT NEEDED TO STOP, REST, HYDRATE TO STAY ALIVE! We ignore the signals of the body and want to continue, so we override the self regulation with an antihistamine further weakening the body. Misuse of the Antihistamine Prescription is the usual cause of Asthma Deaths. Instead of helping an Asthmatic recover by Hydrating the body, a Doctor gives the person a way to override the symptom. when this is abused a person uses it more and more. When they have a severe attack and do not have a Nebulizer, they suffocate! In My Opinion, the Doctor should be charged with the Death. Our Modern World simply misunderstands the importance of the qualities of water needed. We can purchase dozen’s of Waters, Drinks, Liquids, juices, Soda, power caffeine and Gatorade type liquids instead of HEALTHY WATER. The average Grocery Store has over 1,000 linear feet of shelf space dedicated to the above assortment of liquids that are ALL Harmful if used instead of a proper water. Proper Water! Water that has been re-structured back to the original condition of Rain Water or as seen in a Snowflake. How do we do that? A modern Kitchen appliance exists that uses Electrolysis to separate out the contaminates, chemicals, Pharmaceuticals from the water, while Extracting a lot of the Hydrogen from the waste water and recombining it with the drinking water. In it’s immediate form the drinking water produced is RICH in FREE HYDROGEN which is recognized as an amazing supply of Antioxidant power. The Measurement of this quality is it’s Oxidation Reduction Potential (ORP) which is the amount or absence of Free Hydrogen. Also, in the process, many damaged water molecules are healed by the recombining of Hydrogen to a damaged water molecule. 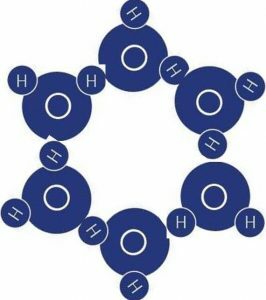 When enough restored water molecules are present they naturally recombine into the exact form seen in Nature, a 6 molecule ring. This is the form your body requires to activate the Red Blood Cells. The INITIAL CLOUD OF FREE HYDROGEN in the water is a strong Antioxidant source in the water. However, those FREE Hydrogen molecules seek out a damaged water molecule and attach restoring balance and satisfying the need of a FREE RADICAL TO BE RESTORED WITH A HYDROGEN MOLECULE! This also restores the water molecule. The claim that the water was no longer good after about 72 hours was because the water no longer showed a strong negative ORP value. That is because the Free Hydrogen had bonded with the water molecules and no longer produced a negative ORP reading. In reality, after 72 hours the resultant water is highly Bio-available to the Blood Stream and the Red Blood Cells, directly through the Portals of the Esophagus and Stomach. If you made it this far, you deserve a medal! I don’t know any other way to explain and distinguish the difference between MAN’S Water and GOD’S WATER! By the way, Who Designed the Body? According to Scriptures, GOD did. Do you think that modern science can improve on GOD’S Design? Good Luck if you do. We need to work on getting back to good food and drinks. Our messing with GMO modification of our food is a serious problem, but that’s for another time and another post. Keith Flint GodsWaterBoy providing God’s Water Freely to those who we can reach. To receive a Text when we update this Blog, please text “Update, and your name” to 1-720-262-9631 and we will send a link each time. oOf course you can opt out at any time. Blessings and Good Health to you. Before starting the 30 Day Challenge, there are a few things you need to know. The Alkalized water that you are now going to drink during the Challenge is NOTHING MORE THAN WATER! BUT, It is truly Water Energized and Restructured back to Natures design, Hydrogen and Oxygen re-balanced without the damage that commercial products have undergone. When taking oral Medication, use TAP or other water with any Medications that you are taking. This water, because it is ENERGIZED, releases the Medicine much more rapidly than the dead, acidic waters you are used to drinking . We recommend not drinking Alkalized water for 30 minutes before and 30 minutes after taking Medications. IF you have any distress (Healing Crisis) dilute your Alkalized water 50% with any other water and drink more. This slows the detoxing properties and flushes the toxins out of the Kidneys. This is a Healing issue. A HEALING CRISIS is your body’s normal response to increased blood flow, Oxygen delivery and waste byproduct removal from your cells. Examples are such as: Moving Headache as the capillaries of the Brain are stretching and opening. You may feel like you have a Bladder infection because the Blood is Transferring more toxins from your cells than the Kidneys can process. Solution, Dilute the water 50% with other water and increase the amount you are drinking for a while, then return to full strength water. Lightheaded! Well of course, if you are increasing your Oxygen delivery to the brain you may feel lightheaded a bit. First thing in the morning drink several large glasses of the water. generally 30 minutes before breakfast. Sip water throughout the day. You don’t breathe once an hour so learn to add water to your body routinely. Dr. Shinya, the Doctor who developed the “Colonoscopy” process Treated over 400,000 people in his career without surgery. He used 3 qts of this Alkalized Water a day as a general treatment. He also had them remove Dairy products, Eat less red meat and more grains. See his brief video of Colons, Before and 90 day After videos! He understood something that modern medicine has lost sight of. The stomach and digestive tract is designed to be Alkaline not Acid! Digestion is an Enzyme process. Do you really think that you have a Tums, Pepto Bismol or Purple Pill deficiency? In normal digestion, the Human body produces acid at the end of the normal Enzyme digestion process. The production of acid is to break up the structures that enzymes didn’t dissolve. Alkalinity should be restored immediately after food enters the Intestines. NOTE: Pre and Pro-biotics cannot live in an acid system. It’s a waste of money to take Pro-Biotics and then drink a soda, power drink, or Bottled water. Bottled water is as acidic as a Soda, but without sugar or carbonation! it’s 10,000 to 50,000 times lacking in Hydrogen completeness! It should be labeled “Pure Free Radical Water!” because that is what it is. IT CAN NOT HYDRATE! Take back your LIFE and HEALTH! Exercise with Alkalized Restructured Water. Ask me how and where you can join a 30 day challenge. THERE ARE SEVERAL WAYS OF PURCHASING YOUR ENAGIC WATER IONIZER. www.HSCWater.net/keithf This is a Private Website of information.for a concentrated 9 video series that takes you through information that will establish a knowledge base, should you wish to google the internet and be exposed to significant false and misleading information. You will be required to provide minimal information to receive an ACCESS CODE for visiting. www.GodsWaterKTFA.com This webpage is a duplicate of the above, but to purchase under Frank26. My name and phone number appear so that I can handle your questions and purchases for KTFA. www.KangenDemo.com Powerful but simple presentation about the water. HELOC: we have had those who own their home, with equity, take out a “Home Equity Line of Credit” from a Credit Union. Borrowing from themselves, using their asset. Generally a very low interest rate. Cash! needs no explanation, however a Cashiers Check is recommended. FOR THOSE WHO CANNOT QUALIFY ELSEWHERE, ENAGIC HAS A ZERO INTEREST LOAN PROGRAM. IT REQUIRES BETWEEN $800 AND $1200+ DOWN, AND 3, 6, 10, 16, 20 OR 24 MONTHS PAYMENTS. No Credit Check, No Credit Reporting, No payoff penalties, rebate of unused monthly office charge. Text 720-262-9631 with “Company Finance Plan Details” please and your name and Email address. iF you plan to purchase several units, for family or others, we need to talk. Each machine has a non-transferable 5 year Warranty and must be purchased in the name of the intended owner. As a registered Customer with an IRS W9 provided, you can buy additional units at a discounted cost, however you remove the option of the future owner having dealer rights. Company policy declares that they will honor warranty and service ONLY on original purchasers units. This is because there is an automatic dealership attached to each purchase. The Patented commission plan can be as important as the product itself. People will want to buy a machine from you when they have had significant healing discovered from drinking your water. Your machine could repay its cost with just 8 to 10 purchasing referrals. For Assistance or Answers to your questions please text 720-262-9631 (Text only) or call 720-281-3965 Please identify yourself when texting, I have over 2000 people who call or text me. Thank you.